The Democrat's claim that the Republicans have a war on women is just plain stupid. Even more annoying is the mainstream media's refusal to challenge the Democrat's absurd premise, especially when the facts prove the polar opposite. If anyone has a war on women, it is the Democrats. But we all know this. I have written about it countless times. Anyway, I wrote a parody to the tune of the Temptations' classic hit, "My Girl." "Our Girls" is my tribute song to our bold, courageous and confident conservative women; Sarah Palin, Laura Ingraham, Ann Coulter and Michelle Malkin to name a few. Speaker Boehner could take a cue from these women when dealing with Obama. 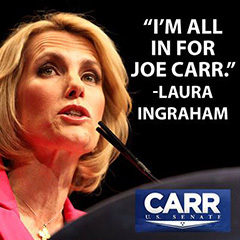 Sarah Palin and Laura Ingraham endorsed Joe Carr over RINO Lamar (voted with Obama 62% of the time) Alexander in the August 7th Republican primary. At a Joe Carr rally, I thought it fitting and proper that we thank and celebrate, Sarah Pailn and Laura Ingraham as well as all of our conservative women. After all, everyone knows that conservative women are the most intelligent, beautiful and awesomely wonderful women in the world. My wife Mary is conservative. To pull off my salute to our conservative ladies, I recruited four young male volunteers from the audience who were wearing "Beat Lamar" t-shirts. It was a hoot and we all had fun kicking the Democrat's ridiculous false narrative in the teeth. Ladies and gentlemen, I give you Lloyd Marcus and the Beat Lamar's performing "Our Girls."